Breakfast is not just the most important meal of the day: it could be the most important meal of mankind. Just think about it. What if Einstein hadn’t had breakfast the day he cracked the theory of relativity? Or if Edison had skipped breakfast the morning he had that world-changing light bulb moment? So was born an idea that developed into an award-winning campaign: a recipe book, packed with the breakfasts of some of the world’s most famous and significant change makers. 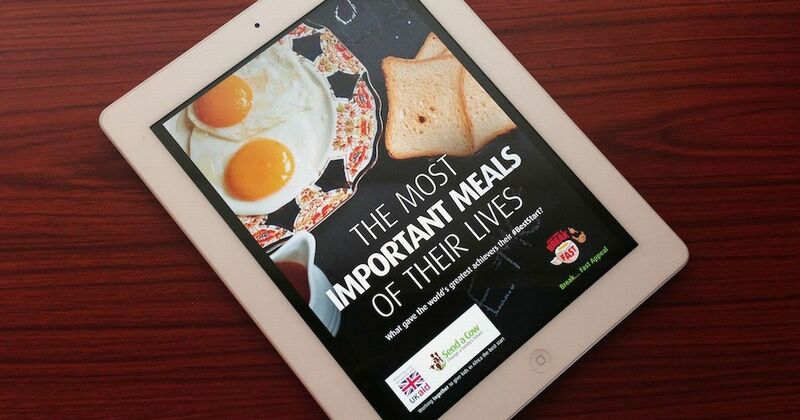 'Most important meal of their lives’ became Send a Cow’s first fully integrated fundraising campaign. The message? That anyone, anywhere, regardless of race, colour, situation or circumstance can achieve great things if they’re able to start their day the right way. With the right support, people can do much more than work their way out of poverty – they can achieve amazing things. The campaign inspired new support for Send a Cow via national journalists, bloggers, A-List celebrities and Government; encouraged donations, raising over £1.5 million (as every £1 raised was matched by the Department of International Development, DfID); and, ultimately, played a role in expanding our work in Africa. These results were only possible because we employed a fully and carefully integrated approach from the outset. In our early days Send a Cow was small enough to plan a campaign by simply pulling our chairs together in the office. However, as we grew that approach became unworkable – we began to struggle to pull off full integration between our internal departments. We needed a focus to make some much needed changes: pulling together a proposal for the DfID match funding gave us that focus. To begin the application process, we first had to identify where our work was most needed and how much a programme of support would cost to deliver. It also meant we had to clearly illustrate how all subsequent marketing would lead towards making that project a reality. Providing livestock, training and support had long been proven as an effective way to help people grow enough food to feed their families and generate an income. But our programmes delivered so much more – people were building businesses, putting kids through school and leading communities. They were entrepreneurial and inspirational. and we were keen to showcase that. We needed a campaign that would capture this positive image of development to raise £500k (£1m once matched) – our most ambitious target to date. We knew we wanted to tap into the idea that our work enabled African families to give their kids a good start in life. But constantly telling and retelling the story of our work in a positive way was becoming increasingly difficult. This is where COW PR stepped in with a great idea – a recipe book full of the breakfasts of inspiring people. The free eBook featured morning meals eaten by some of the greatest men and women in history, including Mahatma Gandhi, Nelson Mandela, Winston Churchill, Rosa Parks, Florence Nightingale, Albert Einstein and more. Here we could clearly explain the notion that there may be countless children in Africa with the potential to be the next Einstein, but, without a decent breakfast to help them realise their true potential, we’d never know. With just £6k to spend on PR, we needed to take integrated activity to another level. With a campaign budget that judges at the CIPR Excellence Awards cited as ‘ludicrously tight’, we really needed to work smart to deliver results. Activities were carved up between COW and the in-house communications team, with support from staff, volunteers, corporate partners and more. COW undertook significant research to deliver a fantastic resource. It also developed the campaign strands and managed the launch, generating 54 pieces of coverage including pieces in The Times, BBC Breakfast, Daily Mirror, Metro, Evening Standard and Buzzfeed. Over 14 million people were reached on social media, generating numerous blog posts and unpaid tweets from Stephen Fry, Jamie Theakston, Michaela Strachan, Thomasina Miers and more. The campaign came full circle when we were joined at our office by the Secretary of State for International Development, Justine Greening, to discuss the impact the funds raised from the campaign will have on our projects to end rural poverty in Africa. With important lessons about integrated working learned along the way, we achieved nearly 10 million opportunities to view through coverage alone, and more funds raised than we’d ever imagined possible. With the match, £1.504 million was raised: by working together we were able to give some of the most vulnerable children in the world the chance of a better life.